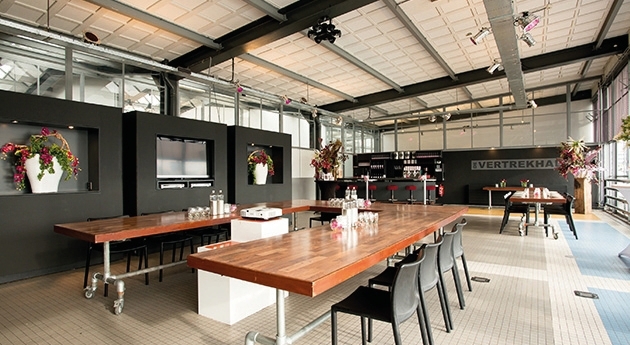 With the wealth of interesting and varied locations for events on offer in the Netherlands, wading through these options to find the right fit for your business meeting or personal event can seem an overwhelming task. Every event planner faces practical questions of choosing the right space for the scale, price and accessibility of the event, but delving further into the choice – with considerations of appearances and theme of the space – can make or break the success of a meeting or gathering. What you want the event to communicate, and the image of your business, are questions to keep at the forefront of your mind when picking a location. Spaces which have a distinct theme can be a blessing and a curse – a wellconsidered decision can save on cost and add a memorable and surprising edge to the event, but comes with the pressure of deciding what works and what doesn’t. In this case, sometimes ‘opposites attract’ can be a good motto to keep in mind – a contrasting location, like holding a new tech event in an old industrial hall can create a surprisingly effective mix. To help manage the process, we’ve picked out some of the best locations in the Netherlands. Located in the heart of Amsterdam, just west of Amsterdam’s central station, the Passenger Terminal Amsterdam contains a spectacular events venue. Looking over the IJ harbour and the city centre, the undulating roof symbolizes the connection between land and water. It is made up of three levels – the Main Deck, Promenade Deck and Panorama Deck, which can be used separately or all together. High ceilings and plenty of natural light make the Main Deck a particularly attractive option, and there is capacity for up to 2,000 people across the different levels. Finally, the simplicity and open character of the space make it a flexible option for decorating to your exact tastes. For those looking for a slightly more cultural venue, the TOBACCO theatre is a gem hidden in Nes, the cultural main street of Amsterdam. With high ceilings and a main room of over 2000 square feet, its construction of steel and rough white plaster gives it a fresh and design-focused feel. Historical shed roofing provides plenty of daylight to liven up the theatre and provides a nod to the venue’s history as an old tobacco auction house. An advanced lighting system and huge white walls leave plenty of scope for a range of atmospheres. Running on a realistic business plan of mixing in the commercial with the cultural, TOBACCO uses the two aspects to strengthen each other and keep the venue’s unique set-up going. 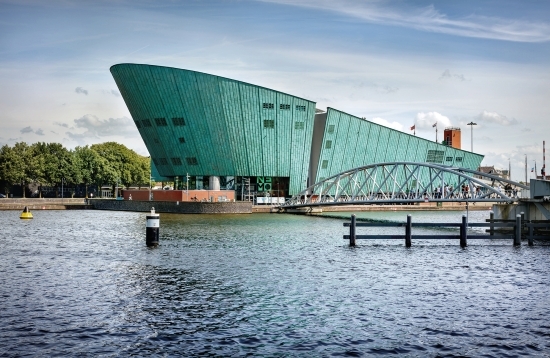 A well-recognised part of Amsterdam’s skyline, the NEMO science centre offers an exciting events venue alongside the museum. Packed with science and technology, there is a range of rooms for an event in the centre – including most excitingly in the museum itself, which has capacity for up to 2000 people. For smaller groups, there is a range of restaurant spaces, theatres and boardrooms to suit any occasion. In sunnier months, events can even be held on NEMO’s unique roof space, which was designed around the concept of ‘interaction’ and can be accessed from ground level. The view from this space, overlooking the Maritime museum and the IJ, is a spectacular addition to any event. The beautiful city park of Westergasfabriek alongside the greenery offers a range of spaces for meeting, working or bigger events. With a forward-looking philosophy, the Westergasfabriek rents out spaces for creative, cultural and innovative entrepreneurs aiming to inspire people across society and offer a sustainable and friendly environment. Regarded as a model for redevelopment due to its cleanup from a polluted site to beautiful park in 2003, the Westergasfabriek aims to become a completely sustainable park not only because of the way it is run, but through the green message it communicates by the events held here. The spaces range from theatres to factories to – most unique – an old gas container from 1902, with a distinctive circular cast-iron ceiling. 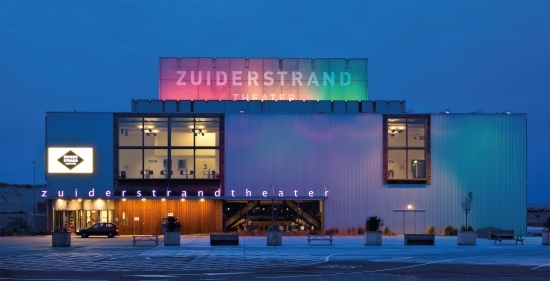 With a prime detached location on the harbour, the Zuiderstrandtheater has an impressive selection of a theatre hall with over 1000 seats, five foyers, a large stage and more than 500 parking spaces. With a total capacity of 1,750 guests, natural light and sea and harbour views flood this location. Flexibility is a key benefit of the Zuiderstrandtheater. The foyers and stage can be used for small meetings; it can even optically reduce the theatre room to create an atmosphere suitable for groups of between 200 and 450 people. With its position on the Spui, the Nieuwe Kerk offers one of the most striking locations in the Hague. A historical site, founded in 1656, the church is one of the oldest buildings in the Hague and is listed as one of the top 100 Dutch UNESCO monuments alongside the Rijksmuseum and the Paleis op de Dam. Now catering for business events, the church is within walking distance of the Binnenhof and across the street from the city hall of The Hague. The church setting provides excellent acoustics in a characterful interior and can cater for meetings from 150 to 700 people. Another historical monument with a rich history, the Remise Den Haag was originally a tram depot, active between 1906 and 1983. In the late 1980s, the space became the home of The Hague Public Transport Museum and is now used for meetings, workshops, receptions, theatre performances and more. Since 2012, the Remise has even become an official wedding location, meaning that the civil registrar can marry you at the location itself. Perhaps the most unique option of any location cited here is that the historic trams residing in the museum can themselves be rented out for workshops with up to 30 people fitting inside each. For those less novelty-inclined, the Spaansche Hof offers a classy alternative for an event. The old Spanish embassy resides in a monumental city palace, providing an oasis of calm in the city centre. With ten rooms alongside a spacious courtyard, it offers a prime location for conferences, meetings, weddings or events. With a history dating back to the 15th century, and residents from Johan de Witt to the Spaniards who renovated the building into what it is today in the 17th century, the building provides options for corporate meetings and training days, as well as stylish options for dining and parties in its luxurious settings. With a rich history, the inspiration for the Evoluon Eindhoven came from the Philips Pavilion in Brussels, which had been home to the culturally ground-breaking ‘Poème Électronique’ by Edgar Varèse at the end of the 1950s. In the 1960s, the construction of the Evoluon Eindhoven began, resulting in three striking building including a futuristic- looking flying saucer. The ‘concrete UFO’ now holds events, with meeting rooms catering for 2 to 200 guests, Trendy accommodations the Philips Hall accommodating over 400 people and the impressive dome, with space for 1200. From weddings to conferences, this striking building offers a venue with a difference. As the hub of the Holland-America Line for a century until the mid-1970s, the Cruise Terminal Rotterdam welcomed and saw off thousands of passengers from Rotterdam to far-flung places across the globe. The building that now comprises the Cruise Terminal was the original arrival and departures hall, falling into disuse when the growing popularity of flying rendered travel by boat virtually obsolete. A two-storey building consisting of a construction of six shell roofs with a span of 18 meters each, the side walls are full glass. A huge concrete staircase provides the focal point of the room, connecting the former passenger areas on one floor and the luggage rooms below. Technology and catering facilities make the 4000 m2 hall an unmatchable impressive venue for any event. 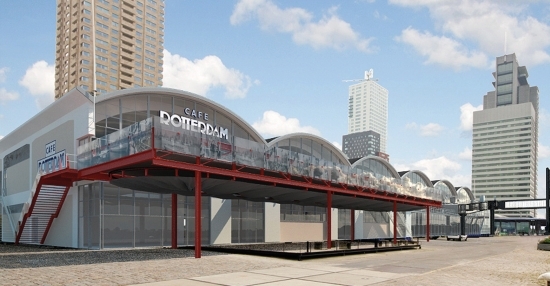 Another option in the port of Rotterdam is provided by the Vertrekhal, or ‘departure hall’ as it translates. Owned by Peter Straver, the hall has been used as a multifunctional location since 2008 and provides a specialised location for corporate events, where meetings, presentations, workshops or receptions can be held. The conference room is catered by the venue, with high-quality tea and coffee and any other catering service you may desire. A magnificent view over the port avoids a stuffy atmosphere and it is easy to wander out of the venue onto the balcony over the port or alongside the quays. A more intimate venue, the space accommodates up to 70 people and is very accessible due to its position close to the centre of Rotterdam. It also prides itself on being an excellent reception location and the ideal location for drinks and networking. Another location priding itself on its green credentials, the Van Nelle Factory focuses on everything from green energy to sustainable water usage, resulting in it being chosen for the Dutch National Climate Conference in 2016. Also on the UNESCO World Heritage List, the factory is often seen as an icon of New Building in the Netherlands, originally used for the production of tobacco, coffee and tea. The resulting facades of steel and glass with concrete support structures and an open appearance provided ample light for pleasant working conditions and are now a main feature of the space. A range of spaces means the venue can be used for anything from dining and drinks to office parties, meetings and conventions. Twelve different types of halls and rooms, as well as outdoor waterfront areas, mean the factory can cater for up to 7,000 people. With 21 warehouses, silos and halls that cater for anything from 50 to 3,500 visitors, DFE has one of the largest capacities in the Netherlands. One of the biggest rooms in the venue used to hold linseed oil mills and provides an impressive steel mezzanine, creating a fascinating backdrop for business events or parties. Many of the original features have been preserved and factory lights and pipes add an authentic touch to the venue. There are a few smaller rooms incorporated into the venue, and more modern constructions in keeping with the theme of industrial decor create an intimate space for less than 200 people. Well equipped with bars, catering and wi-fi, the unassuming factory building outdoes its first impression of the exterior with an impressive array of event spaces on the inside. Comparable to the old tram warehouse in The Hague, the Railway Museum in Utrecht provides an educational event space, taking you through 175 years of railway history in the Netherlands. Another space allowing for large groups, the museum can cater for up to 3,000 people. Meeting rooms between the trains themselves offer a novel space to spark ideas and even dine, but the highlight of the space is the opportunity to rent out the entire museum on Mondays or evenings. In the winter, new life is breathed into the museum as it is filled with hundreds of Christmas trees, thousands of lights and an antique carousel, providing a magical atmosphere for a New Year party. The final historic building on our list comes is the Castle of Wittenburg. When a young gentleman bought the land in 1899 to build a country house, the story of the castle began. 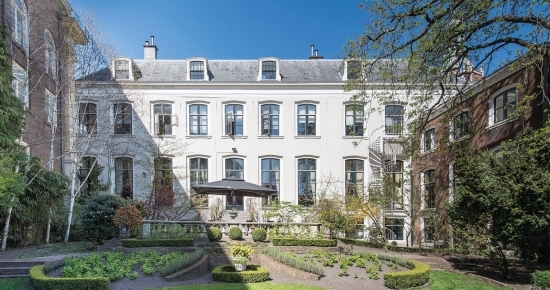 With the complex changing very little over the years, the hall and stylish interiors of this impressive house provide some peace in Wassenaar. A beautiful garden provides an excellent setting for meetings in calmer weather and can be combined with the indoor spaces. A huge range of rooms gives many options for your event – the large lounge allows for up to 100 people, with smaller rooms, including a bar, conservatory, library and board rooms providing more intimate spaces. For the most highprofile events, the Orange Nassau hall and all castle rooms together have a capacity of up to 400 people.